One of the great talking points of late has been the severity, or even the existence, of climate change. There was a time, maybe just short of 30 years ago, when the scientific and political consensus were on the same track, agreeing that man-made carbon and methane emissions were changing the climate. A lot of industry pushback, in the form of like-minded politicians and convincing-looking counternarratives, soon cropped up. Arguments of “job-killing regulations” and no small amount of doubt-sowing opinion pieces, studies and so forth muddied what was at one time a clearer picture. And to be frank, the far-off implications of what might happen didn’t move the meter much in terms of public opinion. What people needed was evidence. Evidence they could see. And not just data, which for some reason, people just don’t trust as much as what they see with their own eyes. Bad things were coming, we were told. But for most, out of sight means out of mind. The trouble with this line of thinking is that when you finally see the negative consequences that were predicted all along, it’s likely too late. And that’s what we’ve seen come to pass in the American West. Two things come to mind, things that are not only measurable, but visible. The first is the expanding wildfire season, and the growth of its severity. Between 1980 and 1989, the American West averaged 140 wildfires of 1,000 acres or larger every year. Between 2000 and 2012, that number nearly doubled, to 250. The wildfire season has grown in length. In the 1970s, the season lasted about five months. Now it’s up to seven months. As western states heat up, snowpack is melting four weeks earlier than normal. Hotter, drier forests are becoming more vulnerable to more frequent and more destructive wildfires. And from NASA, data show that as bad as things are looking in the western U.S., the problem is significantly worse in eastern Brazil, east Africa and western Mexico. The statistics for 2018 obviously aren’t in yet, but if it seems like the entire West is on fire, you’re not too far off target. Drought in the U.S. Southwest created massive wildfires in Arizona, northern New Mexico and southwestern Colorado. Wildfires later erupted in Utah and Wyoming. Record-setting blazes are scorching California once again, and massive fires are currently burning in Montana and British Columbia. It’s one of the worst fire seasons I can remember, and my guess is by the time 2018 ends, it could be a record-setter. Lengthening, more damaging wildfire seasons are one thing. But there’s more. The nature of the arid west is changing, too. It’s growing. A meridian running through the plains of Canada and the U.S. and into Mexico is seen as the diving line between the drier West and the wetter East. Researchers, according to NPR, are discovering that line is moving east, increasing the size of the Rocky Mountain rain shadow and making the breadbasket of the U.S. that much smaller. Farmers are finding it more difficult to successfully irrigate their crops (and the depletion of the Ogallalah Aquifer will only make this harder), so they’re switching to ranching, which is less water-intensive. The arid climate of the West is edging its way into the wetter, more humid East. And that will affect agriculture and livelihoods for people in the Great Plains. Right now, it’s difficult to measure the impact of this shift, but you can imagine its potential significance. Production of food and biofuels lies with the success of agriculture in the Great Plains. If that becomes less tenable in places like the Dakotas, Nebraska, Kansas, Oklahoma and Texas, the shift will be felt not only by the farmers themselves, but consumers in the U.S. and abroad. The real question becomes one of figuring out how far east that dry/wet dividing line will go. At one time, people might have wondered what climate change will look like. Well, now we know. It means longer, more intense fire seasons. It means less land for farming, and a fundamental change in the lifestyles of people making a living in the Great Plains. In other words, some people asked for evidence. Now you can see it for yourself. Oklahoma Attorney General Scott Pruitt, who is the Trump administration’s pick to lead the Environmental Protection Agency. I’ve waited a bit for the fallout of the November elections to settle, to give myself a little time to take stock in what the results will mean when it comes to conservation. There are a lot of mixed messages coming out of Donald Trump’s transition team as to what we can expect from his administration concerning public lands and the environment. If you’ve been a reader of this blog for any length of time, you know where I stand here. Federal public lands belong to all of us, and federal stewardship of these lands are key to preserving them for everyone. A lot is also at stake when it comes to issues of clean air, clean water, wildlife habitat, public health and those who work in tourism and the outdoor industry, itself a $646 billion contributor to the national economy. A healthy public lands system and a vigilant stance on clean air and water are vital. I’m not going to say much (at least not yet) of Trump’s pick for interior secretary, U.S. Rep. Cathy McMorris Rodgers of Washington. All I know for certain is she seems to agree lockstep with the Republican Party platform on public lands, that is to open them up for drilling, mining, logging and, if so desired, sale to the states or private interests for use of their choosing. She is also a climate science denier. Clearly these are stances in which I am in disagreement, and her leadership of the agency that manages federal public lands might be a good topic in the future. But I do want to examine the broader picture of the nation’s air, water and land. And there is one particular nominee I do want to focus on, and that is Trump’s pick to head the Environmental Protection Agency. While my knowledge of Rep. McMorris is relatively thin, it’s different for the EPA pick, Oklahoma Attorney General Scott Pruitt. Scott Pruitt is fairly typical in what you see in Republican political circles, advocating for smaller government and fewer federal regulations. Like Rep. McMorris, he’s a climate science denier, calling climate change “far from settled science.” When he was elected attorney general, he set up a unit in that office to monitor and take legal action on anything he deemed “federal overreach.” He sued the federal government over certain aspects of the Affordable Care Act, and joined Nebraska in suing the state of Colorado over its legalization of recreational marijuana use and sale. But his biggest legal target has been the EPA, the very agency he is slated to lead. On at least eight occasions, the EPA has been sued by Pruitt’s office over regulations regarding emissions from oil and gas production and coal-fired power plants. He has close ties to the energy industry, taking in more than $316,000 in campaign contributions over the years from individuals and groups with ties to that sector; Pruitt’s PACs have received even more. In fact, those ties are so close that he once accepted and signed a letter to the EPA that was written for him (with a few minor edits) by officials at Devon Energy, a large Oklahoma City-based oil and gas company. Politics being what they are, and with Oklahoma being a very conservative state, none of this should be much of a surprise, though in some instances, it does send up a few red flags. 1930s dust storm in Cimarron County, Okla. The Dust Bowl. Back in the 1930s, crop rotation and soil conservation wasn’t much of a thing. Huge swathes of Oklahoma acreage (as well as significant chunks of Texas, Kansas, New Mexico and Colorado) were vulnerable to losing topsoil (and thus creating a perfect storm for crop failure) if the conditions were right. Around the time the country was in the throes of the Great Depression, record heat and drought created those conditions, wiping out crops, bankrupting farmers and creating huge dust storms that blacked out the sun. Lessons from the Dust Bowl days taught us a lot about proper soil conservation, but not before thousands lost their farms, livelihoods and homes. Great migrations of Oklahomans headed west, and a famous book, complete with Okie stereotypes’s personified by John Steinbeck’s Tom Joad protagonist, followed. The Sequoyah Fuels disaster. Nuclear power seemed to be the answer for American energy independence, but funny things happen when you start playing with radioactive materials. The Sequoyah Fuels Corporation had a nuclear fuel processing plant near the small town of Gore, Okla., and in 1986, an explosion there released 29,500 pounds of gaseous uranium hexafluoride, launching a 30-foot column of poisonous fumes into the air. One person died and 37 people were hospitalized. General Atomics bought the site a few years later, then suffered its own troubles — a 20,000-pound spill of uranium tetraflouride powder, and the discovery of some 21,000 pounds of uranium under the site’s main processing building. Uranium levels in the groundwater underneath the plant were 35,000 times higher than federal regulations allowed. The facility was eventually shut down, but there are still buildings near the plant site — including the old Carlisle School — that remain abandoned for fear of radioactive contamination. Several million cubic feet of contaminated material are on the site to this day, and there is fear that toxins could leak into groundwater or taint the nearby Arkansas River. Maybe a little more red tape and a few more regulations would have helped (though that would be an Energy Department and not an EPA function). In lieu of that, Sequoyah Fuels’ buildings, vehicles, toxic sludge and contaminated soil have all been buried underneath large berms, which will be monitored by the Department of Energy (and Rick Perry!) once the cleanup operation is complete. Chat piles of toxic mine tailings loom over a neighborhood in Picher, Okla.
Tar Creek. In what is Oklahoma’s biggest environmental catastrophe, and what is dubbed by some to be the country’s worst environmental disaster, a small corner of northeastern Oklahoma that was rich in lead and zinc deposits is now a major EPA Superfund Site. Dating back to the late 1800s (and seeing its heyday through much of the 20th century), zinc and lead mining in Ottawa County, Okla., as well as adjacent parts of southeastern Kansas and southwestern Missouri, was big business. As with any large mining operation, there are waste products — called mine tailings — that end up being left behind once the ore of the desired material is refined. So in the towns of Picher and Cardin, massive chat piles of mine tailings rose around and within the community like small mountains. But the chat piles were contaminated, poisoning ground water, creeks and streams. Children in these communities began suffering the effects of lead poisoning, and with no realistic way to clean up the mess, the government was forced to buy out all the properties in Picher and Cardin. Both communities are now ghost towns, forcibly abandoned by contaminants left out in the open during a time when mine tailing regulations were spotty at best. Waters in the Tar Creek area are still poisoned, and unlike the towns’ residents and many of their homes and businesses (a tornado wiped out many structures there in 2008), those giant chat piles remain. Oklahoma earthquakes. This may be a shock to you, but Oklahoma has a history of seismicity. In 1952, a 5.5 earthquake shook the state, and even cracked the floor of the state Capitol. 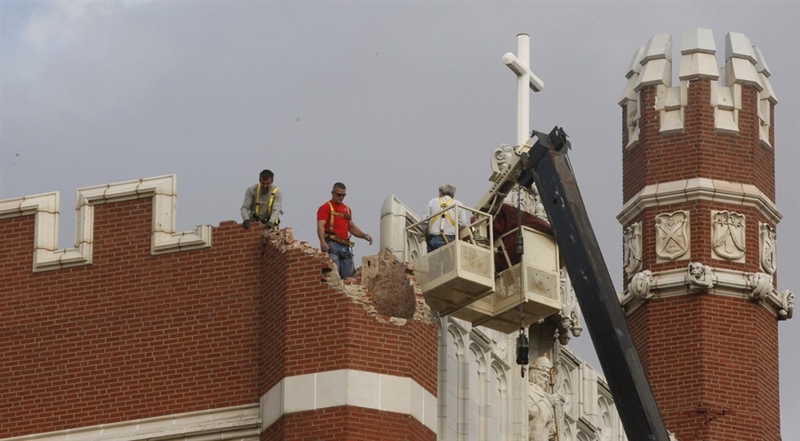 But most Oklahoma earthquakes were small and rare. Until around 2009. At that time, and with increasing frequency and strength, Oklahoma went from being a mostly earthquake-free state to the country’s most seismically active. Temblors went from infrequent to several hundred a year in that time, and in some cases, damaging — a 2011 event near the central Oklahoma town of Prague buckled pavement, damaged homes and toppled portions of buildings as far as 30 miles from the epicenter. In 2016, a series of earthquakes near the towns of Pawnee and Cushing did even more damage, with one quake registering a 5.8 magnitude — a state record. The cause was not some new mountain range trying to break through the state’s famous red clay. No, it was caused by the disposal of wastewater from oil and gas drilling activities. By drilling deep disposal wells and injecting wastewater underground, fault lines long dormant were exposed and activated. The severity won’t rival anything along the San Andreas fault of California, but the damage is enough to spawn a number of lawsuits. The state was slow to respond, and received a lot of pressure from the energy industry and its political allies to downplay any link between oil and gas activity and the quakes. Eventually, science won, and soon after we discovered that if you decrease or shut down disposal well activities in quake zones, the number of quakes diminishes. But scientists warn us that even with tighter regulations on disposal wells, the damage is done — Oklahoma will likely see more quakes, and the chance of something 5.0-magnitude or greater still exists. This will likely persist for another 5-10 years, according to one study. Obviously, Pruitt is not to blame for these events, and the EPA’s scope wouldn’t cover them all. But as an elected official representing this state, they are things of which he should be aware, and the lessons therein point toward the need to keep a close eye on how human activity affects the environment. No one wants an overly intrusive federal government that squashes business. But the EPA’s role in protecting the nation’s air and water is vital. It’s one that shouldn’t be relegated to a “hands-off” approach until something bad happens. It needs to be a proactive watchdog. It’s been said that those who don’t learn from history are doomed by it. Mr. Pruitt should look at Oklahoma’s environmental history and understand that when he heads to Washington, his job isn’t to serve the donors that have fueled his political ambitions. His job is to protect the land, the air and the water. It’s to protect us, so we don’t suffer calamities like the ones I described above. Don’t let the legacy of Tom Joad come back haunt the entire country. I was scrolling through a social media feed the other day when I saw a map that blew me away. I’m a bit of a map geek, so I clicked the graphic to give it a closer look. It was posted by The Nature Conservancy. What it shows are the various regions that make up the Mississippi River watershed. We all know that the Mississippi is huge, one of the world’s great rivers. And yes, a lot of us know that there are a number of big rivers that feed into it. But seeing it on a map like this is a great visual that illustrates how much of our country is connected by this amazing river system. From New York to the east, Montana and Idaho to the west, Canada to the north and all the way to the Gulf of Mexico via Louisiana to the south. Thirty-one states in the U.S. and two Canadian provinces are part of this watershed. Even at great distances, we are all connected. The summit of Mount Shavano, Colorado. From snowmelt and rain runoff at these heights, the river cuts through valleys and gorges through Colorado before beginning its slower, wider meanderings through Kansas, Oklahoma and Arkansas before emptying its contents into the Mississippi River far to the east. Here’s what the river looks like about five miles south of me right now. The Arkansas River, as seen from its west bank in Tulsa. Hard to imagine that the snows atop that 14,000-foot peak in the first photo will eventually roll on by in my hometown hundreds of miles away. But that’s exactly what happens, more or less. This is a story told over a huge swath of the country. Along with the Arkansas, the Missouri, Red, Ohio and Tennessee rivers, fed from mountain streams in the Rockies and the Appalachians, make up this sizable network of waterways. Snowmelt from the north woods of Minnesota finds its way to the bayous outside New Orleans. If there is a point to be made, it’s that the things we do locally don’t stop at our doorstep. Decisions made in Montana and Indiana can have consequences in Missouri and Louisiana. Aside from the impressive scale the watershed represents, there is the realization that what we do upstream affects a lot of people downstream. Anyway, just some food for thought. If you want to learn more about the America’s Watershed Initiative, click this link. 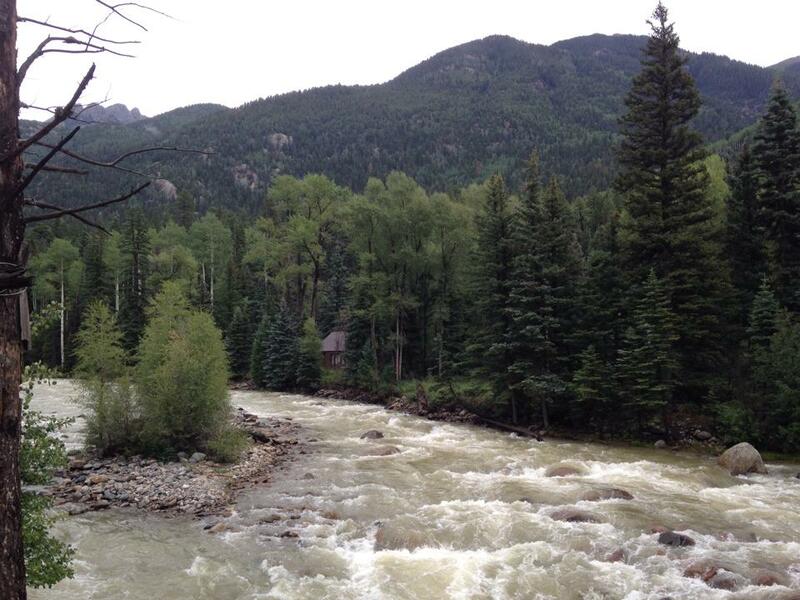 The Animas River in Colorado, seen by me in July of 2014. My first view of the Animas River was about a year ago. First seeing it in Durango, then taking in its seemingly pristine waters on the train ride to Needleton Station, about halfway to Silverton. There is a pedestrian bridge that allows hikers to cross the river on the way to the trails leading up to Chicago Basin and its rugged, wild and high peaks. On the up and on the way back, I had to stop in the middle of that bridge and just stare at the river as it flowed by. Carving its way through the rugged San Juans, I couldn’t help but think how awesome it would be to fish those waters, and what it must be like to have a cabin on its shores, listening to the river wash its way over the rocks and fallen trees. Few things are more peaceful. A year later, I saw the Animas through the eyes of the news. The Gold King Mine, upstream closer to Silverton, dumped some 3 million gallons of sludge poisoned with arsenic, cadmium and lead. 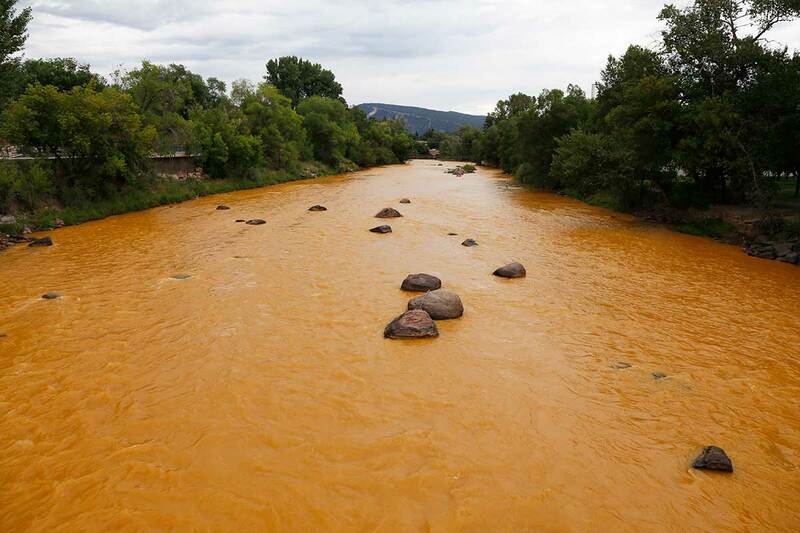 The spill turned the river’s waters a putrid shade of yellow-orange. The cruel irony of this was the fact that the spill was actually caused by a crew working with the Environmental Protection Agency, which was there to find ways to keep the mine from leaking contaminants into nearby Cement Creek. My initial thought upon learning this news: We did this to ourselves. The EPA, already a punching bag for business and political interests keen on rolling back environmental regulations, is taking a beating right now. And yes, there should be repercussions for this disaster. Most of the spill has already washed downstream and will dissipate soon enough. But pollution in the riverbed will persist for some time, settling into the sediment to be released anew every time a rock moves or something else disturbs the waterway. The reality, however, is the Gold King spill is really just a big event in a chain of numerous, smaller instances where leaking mines all over the San Juans have been polluting watersheds in the West for decades. North of Silverton, in Matterhorn Creek, small mines have clouded those waters for some time, and they won’t be clean anytime soon. Other waterways are similarly fouled, forming a long list of bullet points illustrating the long-term effects of extracting wealth from the ground. The Animas looked sick on August 5, but it’s had a small level of toxicity for some time. So have a lot of rivers nearby. Some are “safe,” but I wouldn’t bother filtering drinking water out of Matterhorn Creek anytime soon. So as it turns out, we’ve been doing it to ourselves for quite some time now. I live in an area of the world where skepticism toward conservation is high. Here in the Southern Plains, the EPA is seen as an agent of big government liberalism out to shut down jobs. There is a strain of positive conservationism among hunters and anglers, but it only goes as far as preserving wild game and fish that are popular among the hunting and fishing crowd. We’ll do what we can to keep a healthy herd of white-tailed deer, but any mention of spotted owls invites immediate disdain. Like a lot of things, we care about the things we see or otherwise value. But anything out of sight is truly out of mind, and that’s what makes conservation so difficult. Energy is king in the Oil Patch. We prosper during the booms, suffer during the busts, promise to diversify our economy, then live large once the demand – and price – for oil goes up. Oklahoma weathered the Great Recession and proved largely immune because of how high the price of oil rose, and how successful horizontal drilling and fracking technology have become. We don’t see the damage to the land you see at most drilling sites – instead, we see the nice homes in tidy subdivisions and the gleaming cities oil wealth has provided. Again, out of sight, out of mind. But as it turns out, there is another ecological price we’re paying as a result of the latest oil and gas boom. Fracking uses a lot of water, as well as a lot of chemicals, to break up underground shale formations that trap oil and natural gas deposits. Something has to be done with that wastewater, with the solution being deep wastewater injection wells far underneath the water table and presumably a safe distance away from human contact. Those wells, however, have frequently come in contact with small fault lines which have been largely dormant for as long as anyone can remember. Until lately. You don’t think of Oklahoma, or anywhere else in the Midwest, as being a hotspot for earthquakes. But for the last couple of years, Oklahoma is the most seismically active state in the country, even surpassing California. Geologists have long suspected injection wells as the source of the problem, especially when these quakes started doing real damage. Most are nuisances, registering anywhere from magnitude 2-3 on the Richter scale, but a few have gone into the 4 to 5 range. One of these, a 5.5 back in 2011, caused significant damage to homes, roads and buildings in the central portion of the state. Years later, after intensive study (and intense lobbying to quash such study), the state of Oklahoma and even a few energy companies have finally admitted that the source of the state’s increase in quakes can be tied to human activity. Every time Oklahoma shakes, we’re reminded that we’re doing this to ourselves. It’s been voiced by some that it is arrogant to believe that man can actually change climate. That, according to this line of thought, is within the power of God alone. If you go too far down that rabbit hole, you’ll find people who believe that climate disaster won’t happen because God won’t allow it. Deeper still, there are those who believe none of it matters because the world is bound for destruction anyway, to be replaced with heaven on earth by the powers on high. 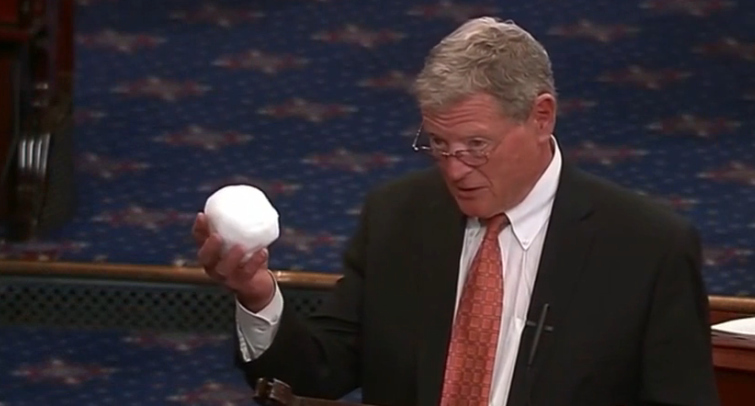 These strains of thought seem to be behind guys like U.S. Sen. Jim Inhofe, Congress’ foremost climate change denier who last winter lobbed a snowball into the Senate chambers in a stunt to illustrate that global warming wasn’t happening. This is troubling on many levels, because it ignores a high degree of consensus that climate change is happening, and we’re causing it. High altitude and polar glaciers are in retreat, island nations are losing land and sea temperatures keep going up at rates not seen before. Carbon dioxide levels in the atmosphere are spiking well beyond what’s been measured before, and those sea water temps are rising at rates not explained by things like natural cycles, sunspots, volcanoes, or any other diversionary alternative theories as to why these pesky climate problems keep cropping up. At the root of it are two things: The world is burning a lot of gasoline, diesel, oil and coal, and to switch gears to where we are consuming less of these things is extremely inconvenient. Curbing the burn also means a lot of people would stand to make less money, and if you want to meet the highest degree of resistance from anyone, hamstringing their ability to earn some coin will do it. People have to be realistic about fossil fuels. They aren’t going anywhere, anytime soon. Airplanes, ships, cars, trains and trucks all need that fuel to move. The computer, tablet or mobile phone on which you’re reading this has parts made from refined petroleum products. So does the car you drive to work, the bike you take to the trail and the shoes on your feet, not to mention your clothes and just about any other product you use and consume. The very food you eat is almost all dependent on energy derived from oil, gas and coal. And in conversations with my brother-in-law Mark, a longtime petroleum engineer, everyone in the energy industry knows it’s in their best interest to operate as cleanly, safely and responsibly as possible. A few bad actors cause a lot of headaches for more responsible companies that are trying to do it right. There are a lot of decent people making honest livings in energy. But at some point, we’re going to have to grow up when it comes to things like clean water, clean air and climate change. We can’t keep ignoring the fact that we do spoil our water, we do make the ground shake and we do cause temperatures to rise. The conversation should not be if we are hurting ourselves, but rather, what can we do to transition into something more sustainable and less damaging. Otherwise, we’ll be left looking back at another disaster, shaking our heads, and wondering why we keep up this cycle of self destruction. An amazing view at Turkey Mountain. Let’s preserve the good. I’m going to say something that might shock some of you. Welcome to the Tulsa market, Simon Premium Outlet Malls. That’s a phrase a lot of us were more than willing to say, provided that the real estate giant did not plop its planned outlet mall on Turkey Mountain. But in a huge turn of developments, reports have surfaced that Simon has changed its plans, now intent on building its massive retail project on an already cleared piece of property in the Tulsa suburb of Jenks, several miles south and well away from Tulsa’s last great green space, Turkey Mountain. Simon announced plans to build an outlet mall on a piece of property along U.S. Highway 75 and 61st Street in southwest Tulsa, land that just happened to be at the southwest corner of Turkey Mountain on a piece of privately owned property. The land overlooks a YMCA kids camp and adjoins a large section of wooded wild land, enjoyed by hikers, runners, cyclists and nature enthusiasts. The thought of having such a large project built there (80+ shops) drew heavy community opposition, with worries over loss of trails, stormwater pollution, erosion, loss of wildlife habitat, traffic safety problems and costs all being mentioned. The outcry was heard by a number of Tulsa City Council members, many of whom voiced skepticism toward the viability and value of having a mall there. The Tulsa YMCA also made its position clear, that the project as proposed was not acceptable given its proximity to the Westside YMCA kids camp. Public forums about the project were one-sided, with large majorities of those attending saying they didn’t want a mall built on the west side of Turkey Mountain. On Wednesday, a report in the Tulsa World, citing the Jenks mayor and city manager as well as documents from Simon Property Group, showed that the company now intends to build in Jenks, just off the Creek Turnpike. 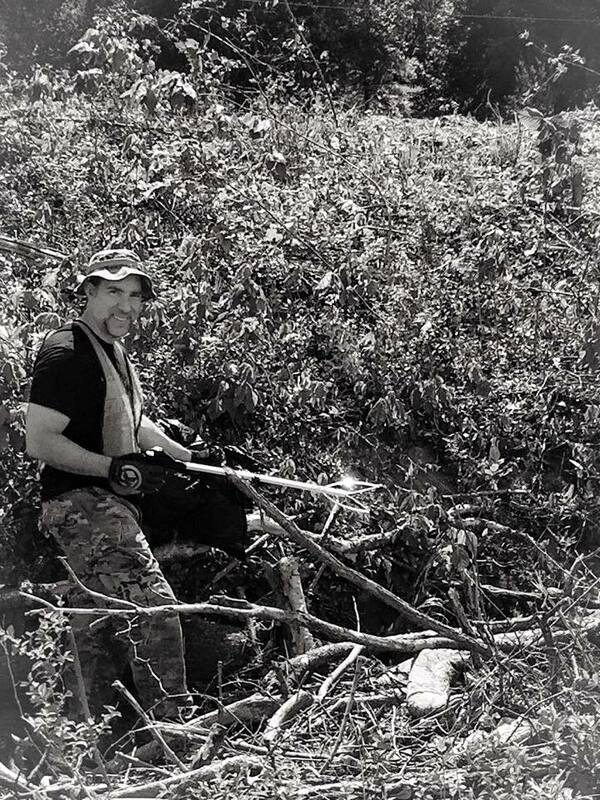 Simon has gone so far to enter into a contract with landowners of the new site in Jenks. For now, the property at Turkey Mountain will remain undeveloped. Although Simon still has a contract on the tract, the focus of the company has changed. Simon has clearly seen that it will not have public or City Council support for doing what it wants to do at Turkey Mountain. It looks like momentum for Simon’s project has swung south. The land in question, however, is still in play. Just because Simon wants out does not mean the land’s owners are going to do nothing. Unless conservation is their stated goal, people don’t buy land just to let it sit there. My assumption is that it’s still for sale. So while Simon is focusing elsewhere (and any future investor would face the same hurdles Simon faced), that doesn’t mean it’s safe. There are efforts underway to take the parcel off the market for good. The Tulsa Urban Wilderness Coalition, which spearheaded efforts to preserve the land, is now an officially recognized non-profit organization that can accept monetary, tax-deductible donations. One of the coalition’s goals is to buy the land if it becomes available. It’s valued at somewhere around $3.2 million. It’s a tall order to raise that much money, but the TUWC has been fighting — and winning — uphill battles since it was formed last fall. If you want to donate, here is a link to the coalition’s GuFundMe site; a link for larger donations through the Tulsa Community Foundation; and for direct donations, you can go to or mail donations to Yorktown Bank, 2222 S. Utica Place, #350, Tulsa, OK, 74114. This is a big win for conservation. Normally, conservation efforts fall short in Red State America, particularly when it comes to conservation vs. economic development. It doesn’t get any redder than Tulsa. But when people were able to see all the issues at stake — preserving a natural space, promoting outdoor recreation and health, valuing quality of life over tax revenues, just to name a few — they overwhelmingly sided with conservation. There is plenty of room in and around Tulsa for economic development, but very little space given to places like Turkey Mountain. Tulsans should be proud for having seen this and, more importantly, acting on it. The message of many voices is strong, even when the goal is a little outside what is normal within the region’s prevailing politics. This is a big win for Tulsa. Certain people at City Hall may disagree (on the grounds that the city is losing out on potential tax revenues), but in the long run, this is good for the city. Turkey Mountain is a tremendous asset for Tulsa. It’s a draw not only for Tulsa-area residents, but for those living outside the metro area and even outside Oklahoma. People go there to enjoy the trails, coming from all over the country. They spend money here. And for people looking to relocate, having an asset like Turkey Mountain is just the sort of thing that makes the city look more attractive. Preserving and even enhancing places like Turkey Mountain is critical in terms of recruiting young professionals and even entire companies. Very few cities in the Midwest and the South have such a place. We do. Turkey Mountain is a huge selling point. Protecting it should be a priority. But what about those potential lost tax dollars? It’s not that cut-and-dry, given that Simon wanted a large tax increment finance district set up to help fund construction of the mall and the substantial infrastructure improvement that would be needed. Given the uncertainty of the plan’s success at that location, the possibility exists that the sales taxes earned at the mall might not offset the city’s costs. Even so, Tulsa can still get behind another outlet mall project on the city’s east side. If economic development really is that big of a priority, that’s where City Hall’s attention should go. If the city can help that project succeed, it will get the new revenues it seeks and enhance quality of life by protecting its natural assets. Keep in mind, nothing is set in stone. All kinds of wheeling and dealing can change things on the turn of a dime. But this week’s news should be welcomed as a positive development and be seen as a call for further action. 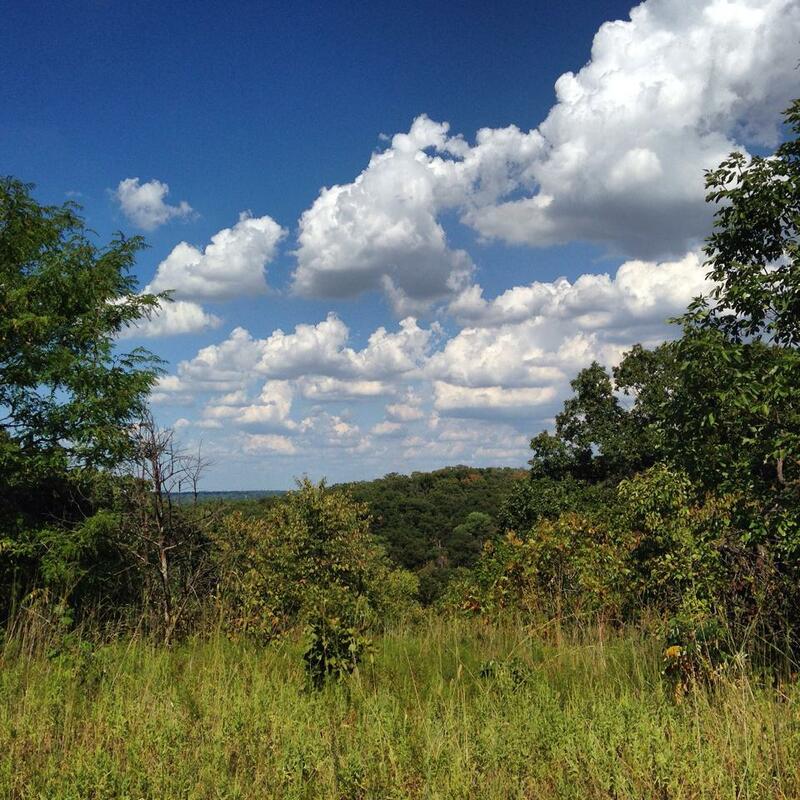 The next step is solidifying the future of the all the property in Tulsa’s urban wilderness. Act accordingly! I’ve been heartened by the number of people who have showed up at different volunteer efforts surrounding Turkey Mountain. 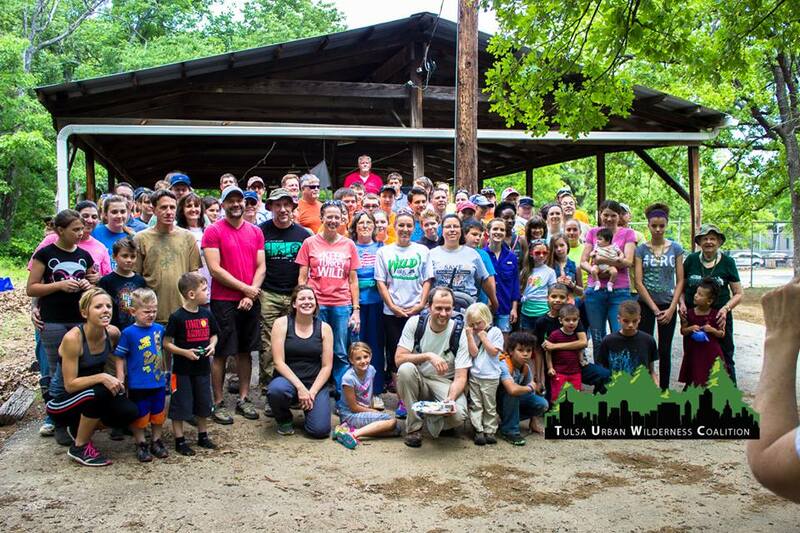 We had a huge turnout for a cleanup and trail maintenance day back in January — the biggest such event that Turkey Mountain has ever seen. When a mall developer announced plans to build an outlet mall on the west side of Turkey Mountain, thousands signed a petition to oppose it, and hundreds have attended forums and written letters expressing a growing sentiment in Tulsa: to Keep Turkey Mountain wild. I shouldn’t be surprised that during the city’s annual creek cleanup event, big numbers would show up. But still, it was a sunny, beautiful Saturday morning, a day where you couldn’t blame someone for playing hookey. But that’s not what happened. It seemed like we had more than a hundred people there, from little kids to retirees. I saw a lot of familiar faces from the Tulsa Urban Wilderness Coalition while spying a good number of trail runners and mountain bikers. But there were also nature enthusiasts, military veterans and even a school’s robotics team. It was a nice cross-section of the community. Volunteers get a briefing from the city of Tulsa’s stormwater expert. The group got a debriefing from the city’s stormwater guru, were given gear for the cleanup and then separated into teams. Folks would scour Mooser Creek itself as well as a few of its tributaries and hillsides that are part of the watershed. A little bit about Mooser Creek: It’s the city’s only creek that has not been altered for stormwater purposes, so it is, more than anything else in the city, as close to being in its natural state as you can get. The waters of Mooser Creek are surprisingly clear and full of life — fish, frogs, snakes, turtles and whatnot. It’s a critical component to Turkey Mountain, feeds the Arkansas River and is quite pretty. But its north bank borders a commercial area and a busy interstate highway. 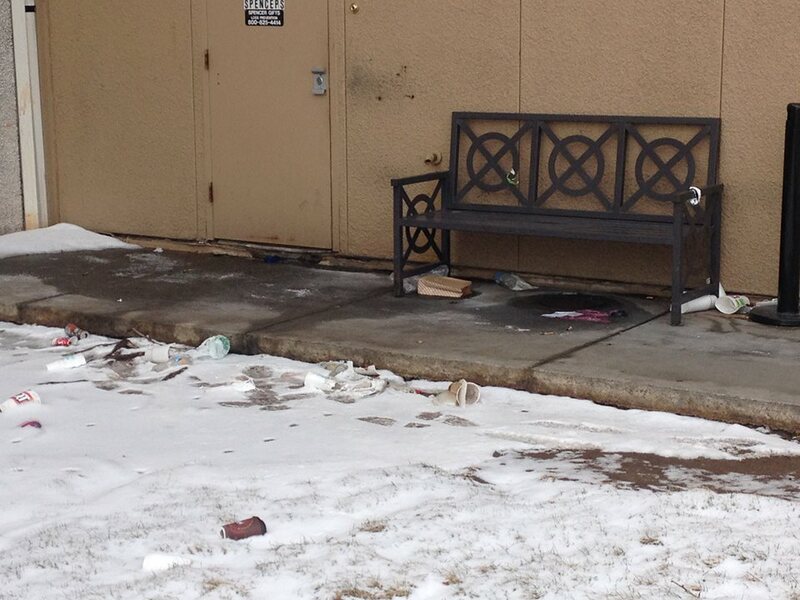 So trash abounds, fouling the creek and, ultimately, the Arkansas River. Mooser Creek was an ideal candidate for the annual creek cleanup. Jenny and one of her boys show off the treasures they found, including a shiny pair of high heels. In addition to picking up litter, organizers wanted to make a game of it by offering a prize for the most unusual piece of trash collected. We found some weird stuff. In my group, we uncovered a baseball, golf balls, some high-heel shoes and a motorcycle seat in a tributary creek. That, plus several bags of trash or the more ordinary kind. 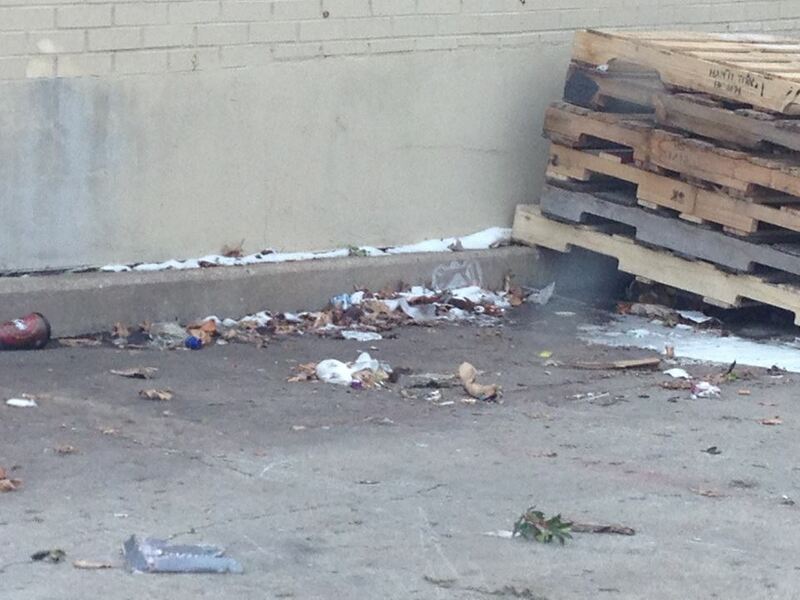 One fella found something more nefarious — a bunch of syringes and a drug stash. Part of the deal, I suppose. Other groups found a computer, a blender, a creepy baby doll, an electronic thermometer, an unopened beer can and a bike helmet, among other treasures. The computer was the big winner. I’m pretty sure it didn’t boot up. What I learned: I can’t speak for the other groups, but I can speak for mine. I’m not surprised that the people who were on my team spent time volunteering. 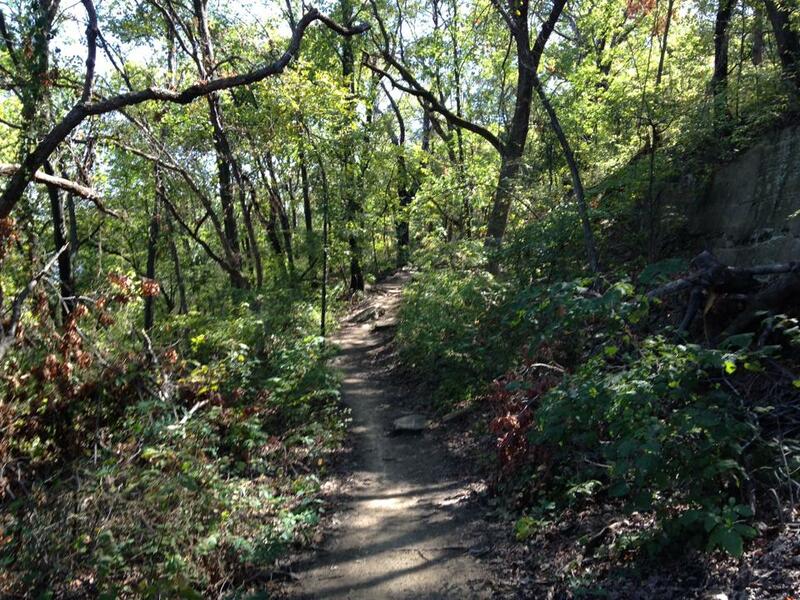 For them, Turkey Mountain has high importance — it’s where they run, hike and bike. I see them volunteer for a lot of stuff like this. Getting into the weeds in a tributary of Mooser Creek. And stylin’ with orange safety vests. What encouraged me the most was their kids. A girl and two boys, all somewhere between 5 and 8, knew why they were there. They were there, and I paraphrase their words, to help the planet. The kids were gamers, too. No whining, and they stuck it out till the end, getting in the weeds, picking up litter and stuffing it in their bags. Gotta respect that. 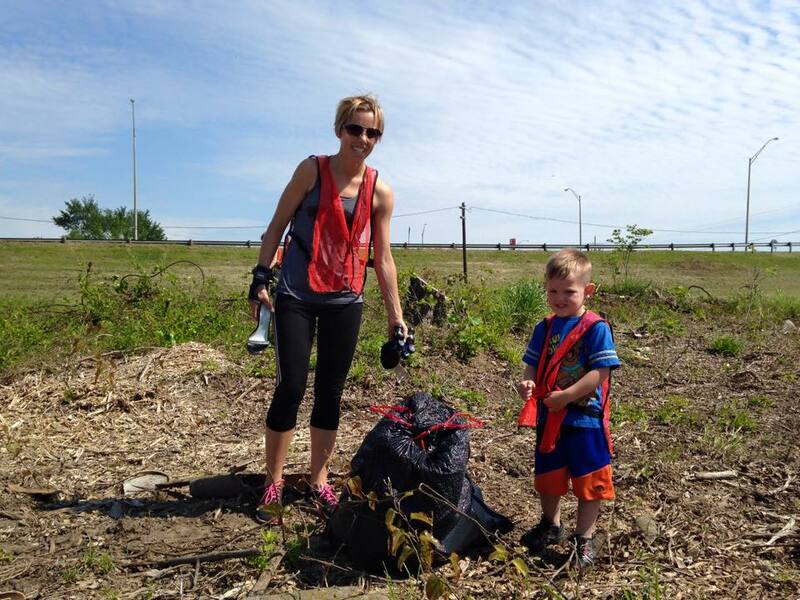 So another volunteer day is in the books, with bigger numbers and positive results. I know a lot of this space is about fitness or adventures, but it’s good to be reminded that what makes the outdoors special doesn’t happen in a vacuum. With so many man-made pressures threatening what’s left of our wild places, it’s important to remember that as much as we receive from nature we need to give back. When it comes to nature, it’s mostly defenseless against us unless we step up to protect it. So if that means signing a petition, educating our kids, writing public officials, or just spending a couple of hours picking up trash, every bit counts. Do what you can. 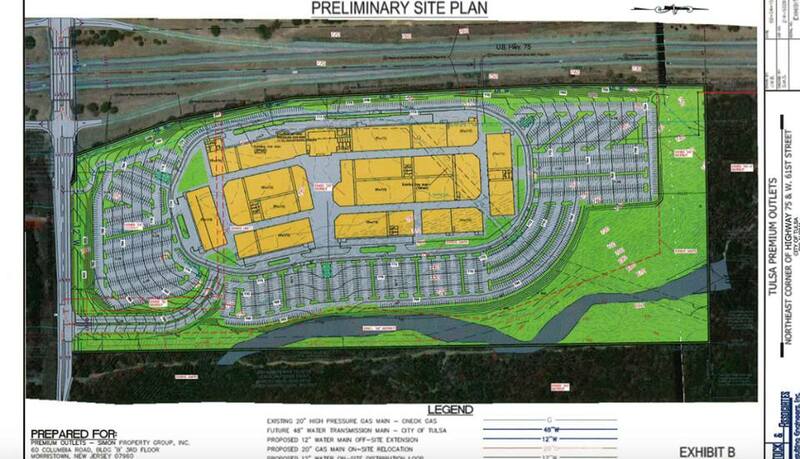 A more detailed plan of Simon Group’s plan for an outlet mall at Turkey Mountain. Note just one entry and exit on a two lane road (traffic nightmares), and at the bottom of the map, you’ll see that the site butts right up to a ravine. No thanks. If you’ve ever followed the boxing, you know what it looks like when a confident fighter meets a buzz saw. 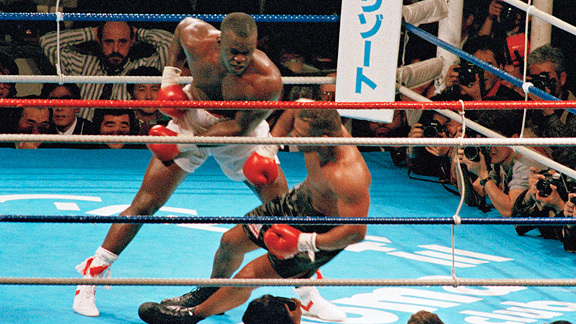 Back in the day, that was Mike Tyson and Buster Douglas. Everyone assumed the champ would dispatch poor Buster in three rounds or less, but we all know that didn’t happen. Iron Mike knew what he had going for him. He just didn’t properly see what was coming at him on that night. Last month, the Simon Group showed up en masse to a Tulsa Planning Commission meeting and told those who were there a couple of important things concerning the outlet mall they plan to build on the west side of Turkey Mountain. First, they said they’d built more than 80 retail developments around the world, and that we should trust them. 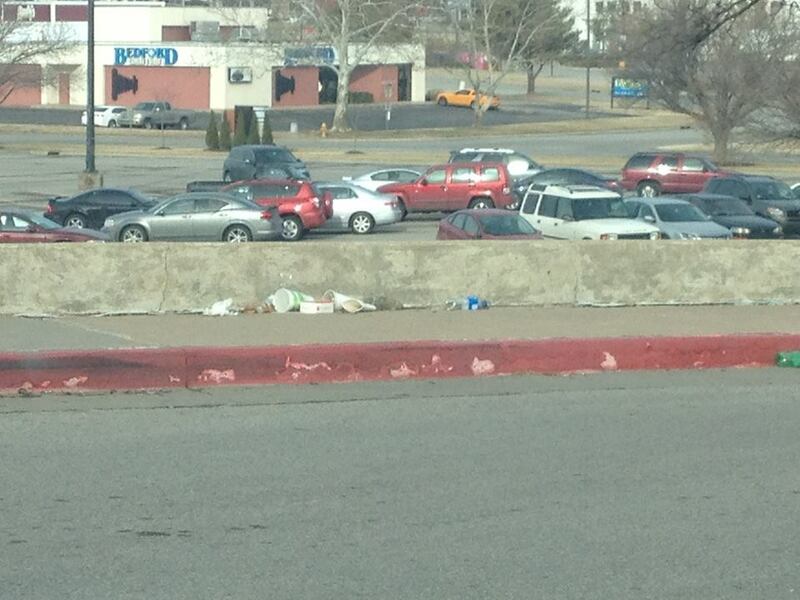 And second, they told us to just look at what they’d already done here in Tulsa. OK, I’ll bite. They told us to trust them. Trust, as I see it, is something that comes with concrete plans and verifiable facts. What we’ve received thus far is a plan that is a little vague on important details, most important of which is how this mall, which would overlook the Westside YMCA kids camp, would affect that camp and the rest of the woodlands in terms of drainage, litter and light pollution. Many of us have no doubt the impact would be negative, and we have yet to see anything concrete that would ease those concerns. It also doesn’t seem like Simon has taken the traffic issues as seriously as the rest of us do, especially the people who live along 61st Street and Elwood Avenue, which is right next to where Simon’s mall would be built. Their plan calls for using a tax breaks to widen the 61st Street bridge over U.S. 75 and a little bit of the road from the bridge to just east of the development. But anyone in the know would tell you that traffic along all of 61st Street and Elwood Avenue, that hilly, curving two-lane ribbon of asphalt, would increase dramatically. The road is simply not built to handle traffic from such a large, high-traffic development like an outlet mall. Traffic going in and out of the mall parking lot would also be congested, as there is just one planned entry/exit. So just from an eyeball test, the mall is going to create a traffic nightmare. Trust is, they say. Sure. Trust, just don’t verify. On to the next point: to look at what Simon has already done here in the Tulsa Market. I’m aware of two projects. One was the Eastland Mall in east Tulsa. When it opened in the late 1980s, it was a pretty great place, but it didn’t last long. All accounts showed that Eastland began failing not long after it opened. It’s still open, but not as a shopping mall. Instead, it’s a repurposed property with offices (now under different ownership), a few restaurants and a tiny bit of retail. So as far as this part of Simon’s track record in Tulsa, I’d call Eastland Mall a swing and a miss. But then there’s Woodland Hills Mall. Now this has, indeed, become a serious retail success story in Tulsa, anchoring a retail area that has become the most powerful commercial engine we have in the city. But also, just look at it. The traffic there is as heavy as anywhere else in the city. The number of street lights between Memorial Drive and U.S. 169 on 71st Street rivals what you might see in the block-by-block traffic control downtown. It’s a sea of big-box stores, chain restaurants, strip malls and other buildings orbiting the mass that is Woodland Hills Mall. Just the thing you want to see plopped in the middle of the city’s top urban green space, right? Imagine that loveliness hovering over the Westside Y. I guess we could teach kids the value of hard work by assigning them to daily litter patrol, right? Needless to say, the skeptics go well beyond me and other trail users. Greater Tulsa YMCA officials have expressed their concerns on two different television news interviews, and members of the Tulsa City Council have expressed very public and blunt doubts about the outlet mall plan’s viability at the location Simon proposes. Many people are also not wild about subsidizing a multi-billion-dollar corporation’s plans for the mall with public funds via a tax-increment finance district. We’ve got plenty of places to shop in Tulsa, but not very much of this. The argument that preserving the land as it is – wild, forested hills – has become the consensus preference for the people who actually live here as opposed to the suits at Simon’s Indianapolis corporate headquarters. People like the idea of maintaining a spot where they can hike, ride a bike, run or take their horse as opposed to yet another shopping center. We’ve got a lot of those already. So Simon asked for a time out. Company representatives were to appear at a Planning Commission next week, but asked for a one-month continuance. Translation: After getting battered by bad press, turning public opinion and open doubts from the people who have final say on the mall’s approval, Simon is taking a standing eight-count in their corner of the ring. I guess these things happen when your plan isn’t very good to begin with, and that’s not a surprise, given how poor the site is for a mall, and the other weaknesses I’ve already noted. That doesn’t mean this issue is decided. Far from it. But it does mean there is a growing chorus of opposition to a mall at Turkey Mountain, and that people in power are listening. That’s a trend I’d like to see continue. If you haven’t written city council members and the mayor, do it. Encourage dialogue. Write respectful, concise and well thought-out letters and emails, but plainly state your case. And don’t just write your councilor. Write all of them. Get their contact information here. If you live in District 2, or anywhere else in Tulsa, go to the public meeting Councilor Cue is hosting. Be there, bring your neighbors, and let your voice be heard. Turkey Mountain is important to all Tulsans and beyond, but it specifically affects her and her constituents. The meeting is at 6:30 p.m. March 17 (this Tuesday) at the Marriott Tulsa Southern Hills, 1902 E. 71st Street. If you haven’t signed the online petition, do so. It’s more than 7,600 signatures now. Numbers matter. Be part of that growing list. Go to the petition here. 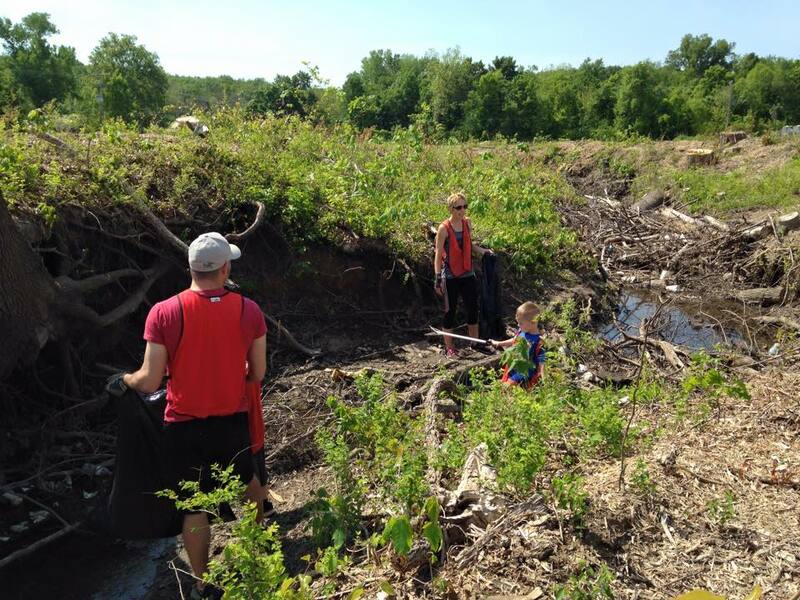 Volunteer to be a part of the Tulsa Urban Wilderness Coalition. 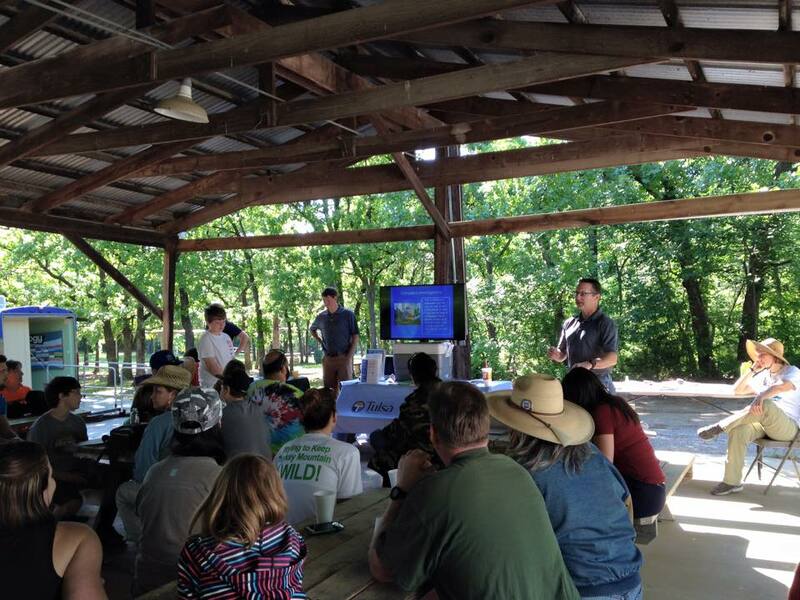 Turkey Mountain and other vital outdoor green spaces in the area are the things this group is trying to protect and promote, and the group does good work. More great things are in the future, including continued advocacy for the greater Turkey Mountain area. Learn more about TUWC and how to join here. Turkey Mountain is an asset as it is. Its existence has been noted as a serious draw for people inside and outside the city, and is a great tool to recruit residents and businesses who care about quality of life issues. Building an outlet mall there would only degrade it. So stand up and be heard. Folks are listening.